Salsify is a tool that empowers brand manufacturers to deliver the product experiences consumers demand anywhere they choose to shop online. The software leverages product is a digital asset and product information management tool rolled into one and is able to orchestrate compelling product experiences through every digital touchpoint. Salsify PXM customers cut across a range of verticals and company sizes, including some of the largest companies in the world, many of which use Salsify everyday to stand out on the digital shelf. At the same time, Salsify has a very flexible approach to data modelling, and is designed to fit and adapt seamlessly inside any ecosystem. Salsify PXM software unites the functionalities of product information management (PIM) and digital asset management (DAM) platforms, to help sellers provide online shoppers with rich customer experiences anywhere in cyberspace. Unlike a traditional PIM vendor, Salsify has a flexible approach to data modeling. Turning multiple sources of data into consumer-ready content, and then into sales, is no easy task. Salsify allows brands to load data, as-is, from anywhere to anywhere. There’s no big data integration project required up front. Instead, brand manufacturers can import and create any content, from any source, and improve it in place and over time according to the requirements they set. Salsify software then quickly assesses if the content meets the requirements of every sales channel the brand publishes to. The platform acts as a single trusted source of content, able to accommodate multiple versions of the truth, for any endpoint. For those sales channels, Salsify integrates with a wide array of APIs and scheduled imports and exports. The software is designed to receive data from any source and send product content to any system, in the optimal format for each channel. All data is transmitted with complete visibility as to what content is where, and its status. 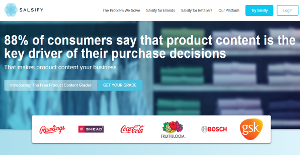 Salsify connects to ERPs, legacy product information management systems, retailer and distributor portals, content agencies, analytics providers, ecommerce platforms, ratings and reviews sites, and more. Customers can also create and share digital product catalogs that are automatically updated and allow users to download the content they need. category- and product-level content performance insights to inform future product content refreshes and drive more sales. The Salsify platform is also enabled with scalability and security features that meet the demands of the world’s largest global corporations. Salsify is built on an elastically scalable infrastructure designed to scale with any organization whether they are managing 100 products or 100 million. Constantly updated platform security functionality includes single sign-on capabilities, data encryption, a robust set of user roles and permissions, and an account-specific security infrastructure. If you are interested in Salsify it could also be a good idea to analyze other subcategories of Best Digital Asset Management Software listed in our base of B2B software reviews. Organizations have diverse wants and requirements and no software platform can be perfect in such a scenario. It is useless to try to find a perfect out-of-the-box software app that fulfills all your business needs. The wise thing to do would be to customize the application for your special requirements, employee skill levels, budget, and other elements. For these reasons, do not hurry and pay for well-publicized trendy solutions. Though these may be widely used, they may not be the perfect fit for your particular wants. Do your groundwork, look into each short-listed application in detail, read a few Salsify reviews, call the vendor for clarifications, and finally settle for the application that offers what you need. How Much Does Salsify Cost? Contact Salsify for enterprise pricing information and other product details. You can also submit a request for a free trial to see if the software is a perfect fit for your business. We realize that when you make a decision to buy eCommerce Software it’s important not only to see how experts evaluate it in their reviews, but also to find out if the real people and companies that buy it are actually satisfied with the product. That’s why we’ve created our behavior-based Customer Satisfaction Algorithm™ that gathers customer reviews, comments and Salsify reviews across a wide range of social media sites. The data is then presented in an easy to digest form showing how many people had positive and negative experience with Salsify. With that information at hand you should be equipped to make an informed buying decision that you won’t regret. What are Salsify pricing details? What integrations are available for Salsify? Pros: I love that I’m able to syndicate and analyze all data. I can easily store all the data that is from spreadsheets and to manipulate it easily. This is great solution for digital asset management. It allows me to reduce the time of managing various digital assets because of the “One-image-to-many-SKUs” capabilities. Cons: I cannot sync my box folder with its folder for images. They could build web-service to solve this problem. Also, I cannot customize digital product catalog in the software, in other words to enhance the look of the catalog by customizing the fields we want to present. Pros: Salsify is flexible tool and helpful for running your marketing projects. I like that the team behind this product is always open to new suggestions and they frequently add new and new features. We have improved our workflow thanks to this product. Cons: I’d like to see an integration with Channel Advisor or many other online marketplace tools. If you need more information about Salsify or you simply have a question let us know what you need and we’ll forward your request directly to the vendor.